I haven’t heard anything yet. Well, I can go and have a check on this one soon since it’s a bit near to my in-laws place. I am just wondering if they have WIFI access too like in Starbucks? 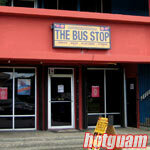 Bus Stop restaurant has a cool, unique concept that makes it stand out among others. It’s ambiance is relaxing. They have good sandwiches too. The Bus Stop was a cute place to hang out. It surely makes you feel at home while enjoying their good portion sandwiches together with a strong coffee.